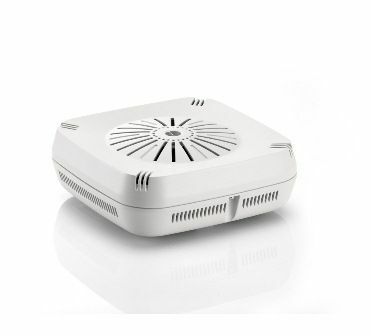 The ECW5110-L is an indoor 802.11a/b/g/n dual-band, dual-radio enterprise AP with a 2x2 MIMO antenna configuration. Through its Gigabit Ethernet port the 802.11n dual-band wireless AP can connect to the backbone network. The ECW5110 supports 802.3af PoE, which enables the AP to be powered remotely by a PoE switch. An AC power adapter option is also included for locations where PoE is not available. Wireless 802.11n Technology - Using 802.11n MIMO (Multiple Input Multiple Output) wireless technology, the AP supports two transmitting and two receiving antennas. Full Management Capabilities - supports Simple Network Management Protocol (SNMP v1/v2c/v3), including MIB II and MIB I. The IEEE 802.1X authentication protocol supports Extensible Authentication Protocol (EAP) MD5, Transport Layer Security (TLS), Protected EAP (PEAP), Tunneled TLS (TTLS), EAP-SIM, and EAP-AKA. Advanced Traffic Management - Support for up to sixteen Virtual Access Point (VAP) interfaces per radio. *The listed specification is subject to change without prior notice.